Background Previous studies have demonstrated the association of abnormalities on diffusion-weighted MRI (DW-MRI) and proton magnetic resonance spectroscopy (1H-MRS) in infants with perinatal asphyxia. The use of therapeutic hypothermia might change this association. Aim To study the association between DW-MRI and 1H-MRS and outcome after perinatal asphyxia and therapeutic hypothermia in infants with a gestational age of ≥36 weeks. Patients and methods Infants with perinatal asphyxia and therapeutic hypothermia (n=88) were included when an MR examination was performed within 7 days after birth. Apparent diffusion coefficient (ADC) values of the basal ganglia and thalamus were calculated, as were lactate/N-acetylaspartate (LAC/NAA) and N-acetylaspartate/choline (NAA/Cho) ratios. Death or an abnormal neurodevelopment at ≥24 months was considered an adverse outcome. Receiver operating characteristic analysis was performed to determine cut-off levels. Results Of the 88 infants, 22 died and 7 had an adverse neurodevelopmental outcome. In infants with an adverse outcome, ADC values of the basal ganglia and thalamus were significantly lower, and Lac/NAA ratios were significantly higher than in infants with a normal outcome. Areas under the curve of ADC of the basal ganglia, thalami and Lac/NAA ratio were 0.89, 0.88 and 0.87, respectively. NAA/Cho ratios were in this cohort not associated with outcome. Conclusions During and after therapeutic hypothermia, low ADC values and high Lac/NAA ratios of the basal ganglia and thalamus are associated with an adverse outcome in infants with perinatal asphyxia. A decreased value of the apparent diffusion coefficient of water in the basal ganglia and thalamus is associated with an adverse outcome in infants with perinatal asphyxia and normothermia. Elevated lactate levels in the basal ganglia and thalamus are associated with an adverse outcome in infants with perinatal asphyxia and normothermia. Low apparent diffusion coefficient values and high lactate/N-acetylaspartate (LAC/NAA) ratios in the basal ganglia and thalamus in infants with perinatal asphyxia are associated with an adverse outcome, also during and after therapeutic hypothermia. Results of DW-MRI (apparent diffusion coefficient values) and proton MRS (Lac/NAA ratios) can be used as biomarkers of outcome in infants with perinatal asphyxia and therapeutic hypothermia; cut-off levels of these biomarkers differed slightly from those in normothermic infants. Apparent diffusion coefficient values were dependent on the MRI sequences. Findings of proton MRS in 1.5 T and 3.0 T magnetic fields were comparable. Since 2008, neonates with perinatal asphyxia are treated with therapeutic hypothermia. It is known that therapeutic hypothermia can change the predictive value of biomarkers, like amplitude-integrated EEG (aEEG) or standard EEG.17 The predictive value of ADC values and 1H-MRS of the BGT in infants with therapeutic hypothermia after perinatal asphyxia has been tested in a limited number of patients only.15 ,18 No definite conclusions could be drawn about differences with normothermic infants. Therefore, the aim of this study was to investigate whether hypothermia influences the predictive value of ADC values and 1H-MRS obtained in the first week of life in infants with perinatal asphyxia for death or an adverse neurodevelopmental outcome. Between January 2008 and December 2013, a cohort of 134 neonates with perinatal asphyxia were treated with moderate hypothermia. Inclusion criteria for therapeutic hypothermia were described previously.3 In all infants, encephalopathy grading according to Sarnat, as well as Thompson scores, was assigned.19 ,20 Of the 134 infants, 46 were excluded for various reasons, including gestational age <36 weeks, MRI examination later than 7 days after birth, and congenital malformations, chromosomal abnormalities or syndromes, including inborn errors of metabolism. The remaining 88 (66%) were subjects of the present study. This retrospective study was approved by the local ethics committee, and the requirement to obtain informed consent for this study with anonymous data analysis was waived. ADCs were measured on the ADC map of the DW-MRI scan, and if present, on the ADC map of the DTI scan (see online supplementary figure S1A). Four regions of interest (ROIs) were placed in the left and right basal ganglia and in the left and right medial thalamus because these structures are most severely affected after acute hypoxic-ischaemic events.1 ,7 ,11 ,23 ROIs were placed by the investigator LCS and reviewed by TA. ROIs were placed in the ADC map on the slice 8 mm (ie, two slices) above the peduncle. ROIs were oval, with a pixel area of around 35 mm2 in the basal ganglia and 45 mm2 in the thalamus. Contact with brain sections other than the BGT, like cerebral spinal fluid and cerebral white matter, was carefully avoided. All measurements were performed on a Philips MRI operator console. These measurements were performed without prior knowledge of outcome. 1H-MRS examinations at the level of the left BGT were available in 80 patients. A PRESS sequence was used to select a single volume of interest (mean volume 4 cm3, range 1.5–9.0 cm3) located in the left basal ganglia, as reported previously15 (see online supplementary figure S1B). Contact with cerebral spinal fluid or white matter was carefully avoided. Parameters were TR of 2000 ms, TE 288 ms and 64 measurements were averaged. NAA, Cho and Cr peaks were identified at 2.02, 3.02 and 3.24 ppm, respectively. When present, lactate was identified as a doublet at 1.33 ppm. Automated curve fitting was performed on an MRI operator console using Philips Medical Care proprietary software. If necessary, manual phase adjustment was applied. Ratios of peak areas of N-acetylaspartate/choline (NAA/Cho) and lactate/N-acetylaspartate (LAC/NAA) were calculated. Neurodevelopmental outcome was assessed at regular intervals after birth, as described previously.15 At the age of 24 months, the Bayley Scales of Infant Development-III was used for assessment (mean 100, SD ±15). A score of <85 was considered abnormal. In addition, cerebral palsy, severe visual problems or hearing loss were considered a moderate-to-severe disability. In this study, infants with an adverse outcome (death or disability) were compared with the infants who survived with a good outcome. Clinical findings are presented in table 1. Statistical analysis was performed using SPSS V.21 (SPSS-IBM, Chicago, Illinois, USA). Infants with a good and an adverse outcome were compared using Student's t-tests, Mann-Whitney U test and χ2 test, where appropriate. ROC curves were generated to create cut-off values for ADC values in the thalamus and basal ganglia, and Lac/NAA ratios in the BGT as described previously.15 Intraobserver and interobserver variability were determined in 10 subjects. Of the 88 infants, 22 died and 7 had an adverse neurodevelopmental outcome (dyskinetic cerebral palsy n=1, cognitive impairment n=5, epilepsy n=1). As expected, patients with an adverse outcome had a more severe degree of encephalopathy, underwent the MR examination earlier after birth and had a higher MR abnormality score (table 1). Ten infants of this study were treated with hypothermia but were shown to have grade 1 encephalopathy. Their treatment was based on a high Thompson score or a suppressed aEEG on admission. In the BGT, left and right ADC values were averaged. Intraobserver and interobserver variation in measuring ADC values were respectively 1.2% and 1.5%. In the basal ganglia as well as the thalamus, infants with an adverse outcome had generally lower ADC values in comparison with infants who survived with a good outcome. Data for the thalamus are presented in figure 1. Mean values for the basal ganglia were 1097±66×10−6 mm2/s for infants with a normal outcome and 870±169×10−6 mm2/s for those with an adverse outcome (p<0.001). 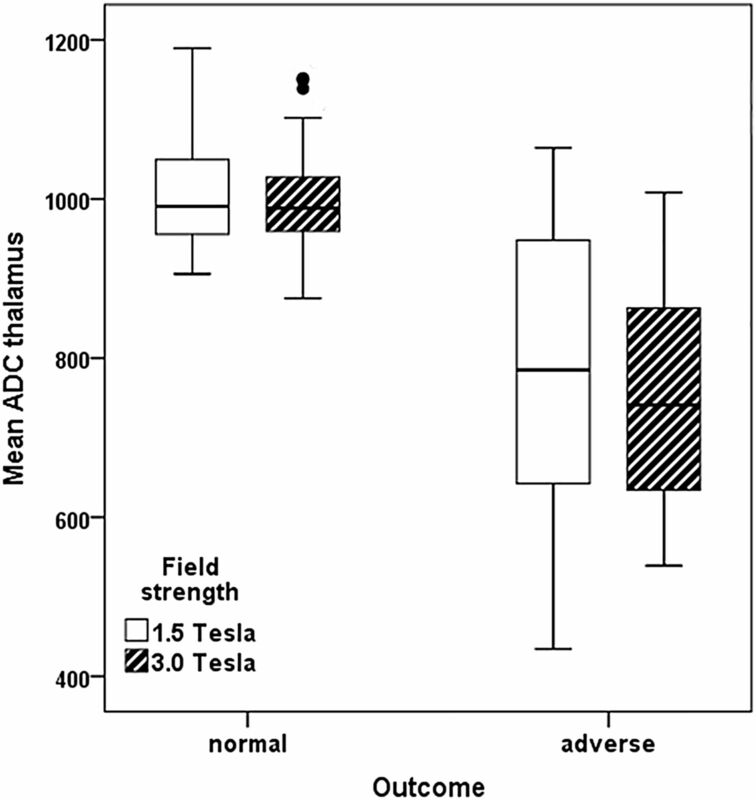 Apparent diffusion coefficient (ADC) values (×10−6 mm2/s) of the thalamus versus outcome and field strength (1.5 and 3.0 T). Differences between infants with a good or adverse outcome are significant, but no significant effect of the field strength is seen. ROC analysis demonstrated cut-off values of 973×10−6 mm2/s for the basal ganglia and 871×10−6 mm2/s for the thalamus (table 2). In total, 3 of the 22 infants who died had ADC values in the normal range in basal ganglia or thalamus: in one infant, mainly cortical and subcortical abnormalities were seen, with a borderline decrease of ADC in the thalamus (863×10−6 mm2/s); in the second infant, a very low ADC value was measured in the thalamus (598×10−6 mm2/s), but not in the basal ganglia; and in the third infant, low values were measured in the basal ganglia (748×10−6 mm2/s), but not in the thalami (910×10−6 mm2/s). Low ADC values in the BGT were present in the other 19 infants. In addition, five survivors with ADC values in the normal range had an adverse outcome: cognitive problems (n=4) and epilepsy (n=1). In the group of surviving infants, no effect of time after birth on ADC values could be demonstrated. In the 29 infants with an adverse outcome, however, ADC values tended to increase between day 2 and day 7 after birth (figure 2). 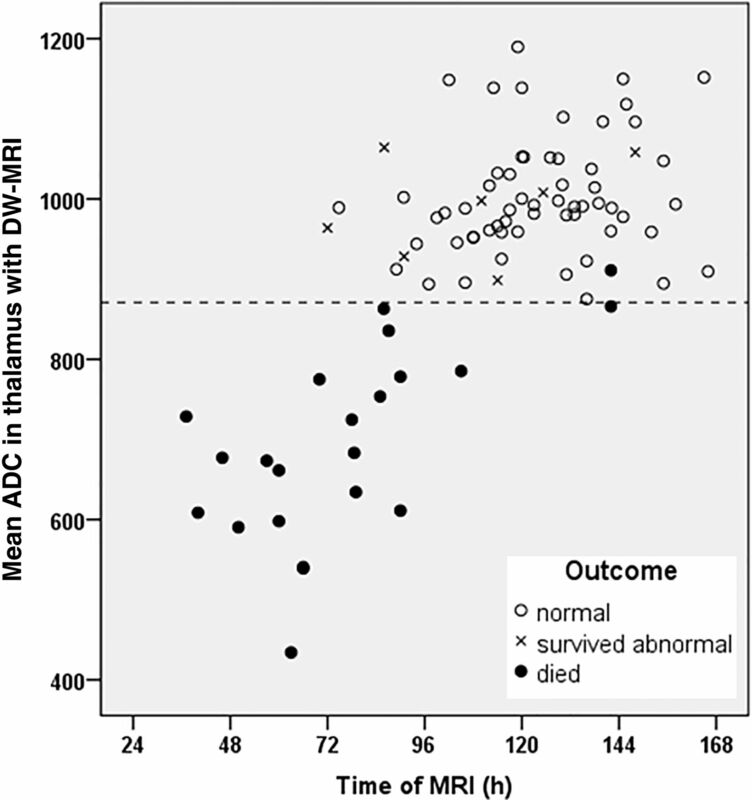 Apparent diffusion coefficient (ADC) values (×10−6 mm2/s) of the thalamus versus time after birth in infants with a good outcome (open circles) or adverse outcome (survived: crosses; died: closed circles). The horizontal dotted line indicates the cut-off value of 871×10−6 mm2/s. DWI, diffusion-weighted MRI. In 59 infants, ADC values were also obtained using DTI. ADC values from DW-MRI were in the same range as those obtained using DTI (figure 3A, B). Linear regression indicated small but consistent differences between both methods. (A) Apparent diffusion coefficient (ADC) values of the basal ganglia measured using diffusion-weighted MRI (DWI) (3 directions) or diffusion tensor imaging (DTI) (32 directions) at two different field strengths (1.5 T, closed circles, and 3.0 T, open squares). (B) Bland-Altman plot of the ADC values of the basal ganglia obtained using DWI and DTI at two different field strengths (1.5 T, closed circles, and 3.0 T, open squares). The dotted lines indicate the upper and lower margins of the 95% CI. 1H-MRS of the left BGT with an echo time of 288 ms was performed in 80 infants. Lac/NAA levels were strongly associated with outcome (figure 4). ROC analysis with an area under the curve (AUC) of 0.89 indicated that a Lac/NAA ratio of >0.40 was associated with an adverse outcome. Also, 8 of the 20 infants with an adverse outcome and 1H-MRS data had a Lac/NAA ratio below the threshold levels. In four infants, lactate could be demonstrated, but the quality of the spectra was moderate to poor. In two infants, cognition was abnormal and one of them had hearing loss, but MRI and 1H-MRS did not show abnormalities, in one infant MRI showed cortical abnormalities and in one infant mainly basal ganglia abnormalities were seen, but no abnormalities in the thalami. NAA/Cho levels were not associated with outcome in the present study. Although the difference in Lac/NAA ratios between infants with a good or adverse outcome appeared larger at 3.0 T than at 1.5 T, numbers of patients were too small for further analysis. Reduced ADC values corresponded very well to elevated lactate/NAA levels (see online supplementary figure S2). Lac/NAA ratios obtained using proton magnetic resonance spectroscopy of the left-sided basal ganglia and thalamus at two different field strengths (1.5 and 3.0 T). Differences in Lac/NAA ratios between infants with a normal or adverse outcome were significant (p=0.002), and differences in Lac/NAA ratios between field strengths were not significant (p=0.40). In this study, we compared the association between ADC values and 1H-MRS in BGT in the first week of life and outcome in infants with perinatal asphyxia treated with hypothermia. A low ADC value of the basal ganglia or thalami, or high Lac/NAA ratios of the same area, was associated with an adverse outcome. Although very low ADC values have been used in the decision to redirect care,24 ADC values were never the only consideration leading us to redirect care since in all infants an abnormal neurological examination, abnormal aEEG findings (burst suppression, continuous low voltage or flat trace for >48 hours) and cranial ultrasound scans (severe echogenicity of BGT) were always involved in the decision-making process. Bednarek et al18 have demonstrated that the pseudo-normalisation of ADC is much slower following therapeutic hypothermia compared with normothermia and may take up to 10 days. Because of this relatively slow pseudo-normalisation, and the fact that all our patients were examined within 7 days after birth, we did not take the time of MRI into account to determine the clinically relevant cut-off level. In fact, multivariable logistic regression models showed that time after birth was not significantly associated with outcome in the present data set with limited variation of time after asphyxia at examination. In addition, magnetic field strength did not affect ADC or 1H-MRS cut-off levels in the present data set. Nevertheless, ADC values and 1H-MRS ratios may depend on field strength and properties of the coils used, so we suggest that locally obtained normal values should be used for clinical decision-making. ADC values were obtained using both DW-MRI with diffusion in 3 directions and DTI using diffusion in 32 directions. Although there is an excellent correlation between the two examinations, absolute values are slightly different and cannot be used interchangeably. It was of interest that all five infants with an adverse outcome and an ADC value above the cut-off value had cognitive problems or epilepsy, rather than motor sequelae. They were scanned between 72 and 148 hours after birth, and none had abnormalities in the basal ganglia or thalamus on T1, T2 or DW-MRI. Two had watershed lesions, one showed a small subdural haemorrhage and two had no abnormalities. A recent study suggested that lactate levels were slightly lower in the basal ganglia, but not in the thalamus during hypothermia.27 1H-MRS has retained the predictive value after perinatal asphyxia and therapeutic hypothermia, although cut-off values were higher than in our previous study. In particular, elevated Lac/NAA ratios are associated with an adverse outcome, which is similar to observations in normothermic infants following perinatal asphyxia.11 ,13–15 ,28–31 In the present study, NAA/Cho ratios of the BGT were not predictive. We cannot exclude that hypothermia delayed the loss of NAA, a neuronal marker, and that infants have been scanned too early after birth to demonstrate a decrease in NAA. For clinical purposes, both DW-MRI and MRS can be recommended. Whereas DW-MRI provides spatial information about ischaemic brain areas and enables discrimination between watershed and BGT lesions, MRS of the BGT has excellent predictive properties, which are less time dependent.33 The present study has some limitations. Second, some patients who subsequently died were scanned within 72 hours after birth during therapeutic hypothermia. Kozak et al34 described a 2% decrease of ADC values per °C, resulting in an estimated 7% decrease at 33.5°C. As a consequence, ADC values close to the cut-off levels need to be interpreted with caution when patients are examined during the first few days after perinatal asphyxia. However, others have demonstrated the usefulness of early MRI.35 When the ADC and 1H-MRS are in the normal range, and clinical signs and aEEG suggest the presence of brain injury, repeating the MRI after rewarming should be considered. Third, all neonates scanned within 72 hours after birth had an adverse outcome, thereby limiting the predictive value of ADC in this time window. The measured ADC values were very low in our infants with an adverse outcome. In infants with a normal outcome, ADC values are much higher and do not show a trend in the first week as demonstrated by Bednarek et al.18 Therefore, we do not consider this a clinically relevant limitation. In addition, normal ADC in the rewarming period had an excellent negative predictive value. Finally, in infants with the most severe perinatal asphyxia and meconium aspiration syndrome, no MRI could be made because their condition did not allow us to do so. It is expected that the ADC values in BGT in the infants who died have been very low. Low ADC values and high Lac/NAA ratios in the BGT obtained during the first week of life in infants with perinatal asphyxia with therapeutic hypothermia are associated with an adverse outcome. For ADC measurements, both DW-MRI and DTI can be used, although absolute values are slightly different. The authors thank the MR technicians of the UMC Utrecht for their dedication during the examinations, and in particular Niels Blanken and Johan de Jong for optimising the MR sequences.
. MR imaging, MR spectroscopy, and diffusion tensor imaging of sequential studies in neonates with encephalopathy. AJNR Am J Neuroradiol 2006;27:533–47.
. Early brain proton magnetic resonance spectroscopy and neonatal neurology related to neurodevelopmental outcome at 1 year in term infants after presumed hypoxic-ischaemic brain injury. Dev Med Child Neurol 1999;41:436–45.
. Increased detectibility of alpha brain glutamate/glutamine in neonatal hypoxic-ischemic encephalopathy. AJNR Am J Neuroradiol 2000;21:203–12. Contributors FG has designed the study, analysed the data and written the manuscript. MJNLB, LSdV and FG have performed the MRI studies. TA and LS have collected the MRI and MRS data. ICvH, CK-E and LSdV have performed the follow-up examinations. LW has reviewed the aEEG assessments and clinical and MRI data. TA, LSdV, ICvH, LW and CK-E, have revised the manuscript in detail. Ethics approval Waiver by the Ethical Committee of our institute. Data sharing statement The data on which the results of this study was based could be obtained by contacting the corresponding author.